Officially open case management all evidence supports the people involved are motivated based on hate of the minority, the disabled and, people who live in poverty as the result of a disability or bias against the minorit. She is now threatened with a truancy charge (Sally Schroer). Eugenie Harris does not have a phone she cannot afford one. According to Sally Schroer’s paperwork she had knowledge of this. According to the Minnesota Human service manual this is where Ms. Schroer should offer solutions and resources to the new in town single mother with a limited support circle. Again neighbors seem to believe that Eugenie was stalked by Le Sueur County CPS. The case worker writes in her notes that the family arrived at the court house on foot…..
Victor Atherton stated “what did you expect walking all over town making yourselves seen. There is a discussion on what she does not have and what she needs to do but no discussion on what sally has for support services that will help her make that happen. The reason Sally Schroer is there is so that she can make an assessment of needed services that can be provided to strengthen the families in need, so that poverty related neglect can be prevented. harge being enforced selectively by Le Centers City Attorney Jason Moran and Le Sueur County Lead Child Investigator Victor Atherton that the threat of a second criminal charge may have influenced the second event. The person who required education for following an example of the school is charged with a crime. The actual facility that inspired the event has been knowingly endangering young children with a special pass. Two of the children were behind on shots. Immunizations are not enforced by law neither are well baby check ups. They are parent made decisions. So it is unclear why these items are listed. The home appeared to be in good condition clean baby proof no safety hazards children are bathed plenty of food and clean clothes. Case Worker Sally Schroer drops by to drop off Tampons. Exigent circumstances are said to exist when:(1) a person’s life or safety is threatened (2) a suspect’s escape is imminent, or (3) evidence is about to be removed or destroyed. This is also termed as emergency circumstances or special circumstances. Does hearing a baby cry for minutes outside a dwelling divided in to three apartments with all tenants home, fall in one of the above categories? Baby colic (also known as infantile colic) is defined as episodes of crying for more than three hours a day for more than three days a week for three weeks in an otherwise healthy child. Typically though babies are born with the ability to cry. When they’re tiny, it’s their main way of communicating. If you hear a crying baby, you usually want to find out why. Sometimes they might be crying because they are hungry, cold or hot, scared, overtired, wet, in pain or uncomfortable. Older babies and toddlers still cry because they’re hungry, tired or uncomfortable. But they are also starting to develop more control over their crying. For example, a toddler might learn that if he cries when he’s put down, their mom will pick them up again. This might lead to louder and longer crying next time they want to be held! Temper Tantrums- Temper tantrums range from whining and crying to screaming, kicking, hitting, and breath holding. They’re equally common in boys and girls and usually occur between the ages of 1 to 3. Kids’ temperaments vary dramatically — so some kids may experience regular tantrums, whereas others have them rarely. They’re a normal part of development and don’t have to be seen as something negative. Unlike adults, kids don’t have the same inhibitions or control. 1) Standing outside a home that is divided into 3 apartments. 2) All tenants are home. 3) I heard a baby cry for a few minutes. The entire event took place in a total of 20 minutes. Genie realized she had not called the children in and it was almost 10 AM. She has 3 sick kids home from school the only person she knows who she can ask to use the phone is the neighbor who has 3 children at home. Genie is worried her children could be contagious so she decides to run next door to quick make the phone call. She was absent for 15 minutes and detained outside for five minutes arguing with Officer Hanna. When she gets in to the apartment sally Schroer was searching through closets and drawers looking for bags and clothing. According to Sally Schroer the children cannot be left alone even for a second. Yet Schroer herself leaves them unattended. She stays outside leaving them unattended until the officer arrives. Schroer said the home is baby proof and had no safety hazards clean children plenty of food and it turns out all three of the kids were sick as Genie had stated. It is my opinion four things were at play that created this 15 minute absence. The first criminal charge being handed out under what appears to be an act of discrimination. I found this listed in the MN maltreatment guidelines below. • Selecting an unreliable person to provide child care. What they have discovered is 100% poverty related there are a list of other things to be considered before determining maltreatment. Victor Atherton decides that despite Minnesota law and rules only for Eugenie Harris is poverty related neglect. Victor Atherton goes to six year old Cameron’s School to conduct an interview with him because the mother was worried her kids might make the neighbor kids’ sick she is a single mom, new in town with a limited support circle and does not have money for a phone. These measures seem extreme for poverty related neglect and educational for assuming a school would not endanger the safety of children or just not knowing the school had a special pass by county officials. Atherton conducted an interview of a child will definitely teach children that being poor is a crime!!! At least in Le Sueur County. Pedophiles with good standing jobs can assault children repeatedly based on the way Brent Christian applies the law . Brent approved an order to have this mothers children placed in foster care with his childless relatives. according to the laws he applied to the order Brent believed poverty that existed as a result of a disability is a parent trying to intentionally harm a child. Sally Schroer is found a 3rd time inside the private residence by the renters who discovered her exiting the residence upon returning home. 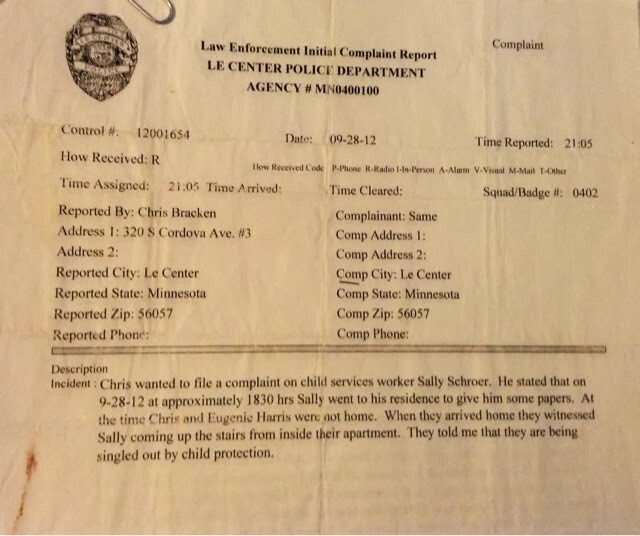 Chris Bracken filed a police report about the incident. Despite the fact that she illegally broke in to a private residence for a 3 rd time the county attorney office does nothing. They may have spent so much money on the fake charges against Eugenie Harris that they did not want to burden the courts with legitimate crimes? Krenik has lied and pushed me manipulated and scared my boys for life. ..this women is playing God, she kept my boys from me on Christmas also and let them go to my sister’s for a night 4Days after another Domestic assault at her home…she told my sister my case was in the process of being Rejudicated. …Lie also judged. Does she think she is God? She sure gets away with everything and makes up the rules as she goes. Then breaks them…it’s very apparent ITS NOT ABOUT WHAT’S BEST FOR THE CHILDREN…What can we the people do to move forward and bring to light the corruption and discrimination, Defamation of character, lasts but not least the irreversible punitive damages that these children will be dealing with the rest of there lives…. Cari Krenik displays anti social tendencies. She is capable of the most perverse acts against adults and children.